UREC @ Nicholson is an 8,000 sq. ft. satellite fitness facility located in Canal Hall as a part of Nicholson Gateway. There are over 50 pieces of cardio and strength training equipment, dumbbell weights up to 75lbs, and a Queenax functional training system. Members are able to sign up for our free UREC @ Nicholson Group X Classes that are held throughout the week. UREC @ Nicholson is outfitted with two gender neutral changing rooms, men’s and women’s locker rooms with showers, and over 70 day-use lockers. 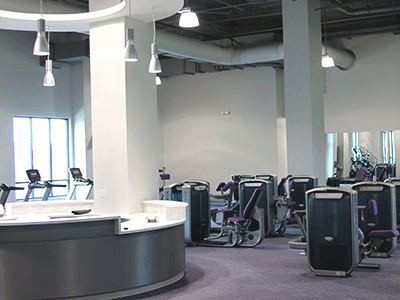 As a current UREC member, you are able to access this facility at no additional cost. Tiger Card is required since there are no iris scanners at this facility. If you do not see the answer to your question below, please send your question to Paul Kwiatkowski, Assistant Director of Fitness, at pkwiat1@lsu.edu . Is there more than one entrance to access UREC @ Nicholson? Yes, there are two entrances into the building. 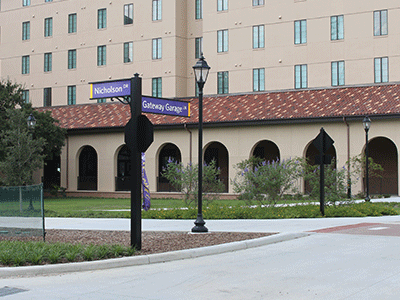 After sunset and before sunrise, the west entrance will only be open as a safety suggestion by LSUPD. What are the hours of operation at UREC @ Nicholson? For a full list of hours, visit the Facility Hours webpage. Will UREC @ Nicholson be open on game days? Yes, from 9 am – 1pm for late kick-off games (6:00pm or later), but closed for afternoon games. How many lockers are available at UREC @ Nicholson? There are 75 free day use lockers available. Yes, there are 2 separate men’s and women’s bathrooms that have 2 showers. There are also 2 gender-inclusive bathrooms equipped with private showers, toilets, and sinks. Will there be GroupX classes taught at Nicholson? Yes, there will be classes throughout the week that include TRX, HIIT, Queenax, and more! For a list of classes visit our GroupX Schedule. Are there places to lock my bike up? Yes, there are a number of bike racks at the west entrance of the building. How do I obtain a UREC @ Nicholson Membership? 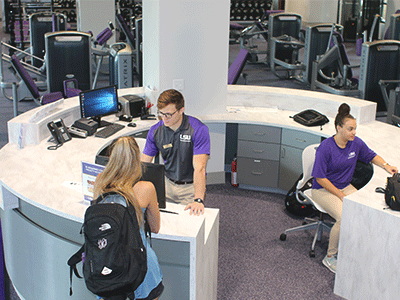 All full time students and current LSU UREC members have access to UREC @ Nicholson without any additional fees to their current membership. Current memberships are paid through student fees each semester, and all you need to enter UREC @ Nicholson is your Tiger Card. Can I purchase a UREC @ Nicholson Membership only? No, all memberships include access to both UREC facilities. Am I paying extra to use the UREC @ Nicholson fitness facility? No, you pay one fee for access to both UREC locations. These fees are paid by full-time LSU students. Can I purchase a membership, day pass, or guest pass at UREC @ Nicholson? Yes, as long as you are eligible. This pass is transferable to the main UREC Facility. No, retail parking is located next to Matherne’s Corner Market, commuter parking is located across Nicholson Drive in the Bernie Moore Lot, and there are residential parking lots throughout the Nicholson Gateway Apartments. How many square feet is UREC @ Nicholson? The UREC @ Nicholson has approximately 8,000 sq. ft. of fitness space that includes cardio equipment, weight equipment, functional training space, restrooms, showers, and changing facilities. What equipment is offered at UREC @ Nicholson? 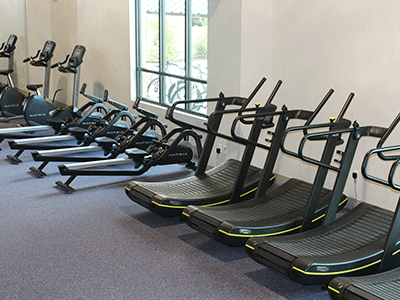 Nicholson offers a range of selectorized equipment, dumbbells (5lbs-75lbs), preset barbells (20lbs-110lbs), Kettlebells (5lbs-80lbs), Spin bikes, treadmills, recumbant and upright bikes, stair masters, and a single bay Queenax Functional Training System.